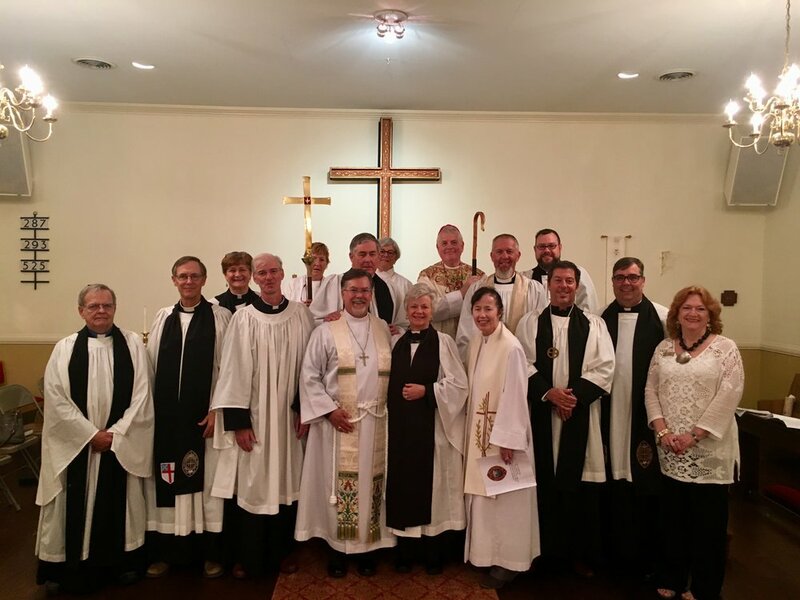 Wednesday night I was privileged to get to preach at the service of Celebration of New Ministry for Holy Nativity, Saint Simons and the Rev'd Tommy Townsend, their new vicar. The picture above is from that service. It was lovely and joyful, and (if I may say so myself) the sermon wasn't half bad. Preaching at an occasion such as that one - much like at an ordination - always gets me to thinking about the topic of ministry, and i want so share some of those thoughts with you. The Catechism in our Book of Common Prayer is quite clear about ministry. First, about the ministers themselves, it says "The ministers of the Church are the lay persons, bishops, priests, and deacons" (BCP, 855). Notice that the laity is listed first; that's intentional. At our baptism we are all "ordained" to be ministers of the Gospel of Jesus; some of us are then ordained for specific ministries within the Body of Christ, mainly sacramental ones. It's helpful to remember that there are essentially only three things priests can do as ministers that lay people cannot, and those follow the handy mnemonic device "ABC." We can Absolve, Bless, and Consecrate. That means we are authorized by the Church and empowered by the Holy Spirit to offer absolution to the penitent, to pronounce God's blessing, and to consecrate the bread and wine at Eucharist. I would point out that no priest can do any of those things alone. We must always have at least one lay person present with us. I like that - it reminds us that all ministry is communal - we are in this together, as members of one Body, the Church. Everything else that we think of as "ministry," that we often believe is or should be relegated to the clergy, is in fact baptismal ministry - what we should all be doing as followers of Christ, carrying out the mission of the Church. That same page in the Book of Common Prayer reminds us that the mission of the Church is "to restore all people to unity with God and each other in Christ." Our ministry is fundamentally one of reconciliation, of restoring what has been broken by human sin to health and to wholeness. It is about mending relationships and restoring dignity and worth to those from whom those things have been stripped away, or as the prophet Isaiah so beautifully said, it is about becoming "repairers of the breach." Pope Francis says (and I quoted him on this in the sermon) that shepherds - ministers - need to be close enough to their sheep to be able to smell them. Ministry is hands on, sometimes dirty, work. It can be hard and tiring, and that's one reason why we have Eucharist every Sunday. The work that we do "out in the world" is part of what we bring to the altar at the Offertory each week. We pile our labor on behalf of Christ atop the altar with the bread and wine, and we ask God to take it, bless it, increase it, and give it back to us to continue our work in the coming week. We come to the altar to encounter the Resurrected Christ and to be fed by him to strengthen us for our ongoing work in the world. So yes, there's nothing wrong with coming to church to "get something out if it." That's what we're supposed to do, but we do so in order to be able to give even more back when we walk out the doors.